If your shipping and handling services are the best, show it to your customers with our Shock Indicator Label. Customers appreciate a visual indicator that shows mishandling of package (if occurred) and helps build a healthy bond. 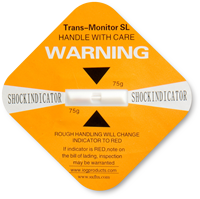 • With a sensitivity of 75G at 50msec, this Orange Shock Indicator Label is ideal for electronics, furniture, medical equipment, neon sign parts, art, sculpture, lamps, china, or porcelains. • Apply the label to the upper right corner of the shipment.